Red wine is full of health benefits. But it’s not because of the resveratrol. It’s the alcohol! Get the same health benefits from alcoholic drink. Resveratrol has been called the “Fountain of Youth” that fights cancer, slows aging, boosts mental health and helps with weight loss. It’s all true, but only in mice and rats. Unless you are listening to a resveratrol supplement maker, the true health benefits in humans are not very clear. Which Wines Have the Most Resveratrol? The “French Paradox” — popularized in a 1991 episode of the TV news magazine 60 Minutes — looked at the seemingly unhealthy French diet and the surprising low rate of cardiovascular disease. They speculated that this contradiction might be due to the French consumption of red wine. In 1992, Cornell University researchers reported that red wine contains resveratrol, a compound originally identified in the 1930′s by Japanese researchers studying medicinal plants. Ever since, it’s been suspected that resveratrol might be the magic ingredient that can explain the French Paradox, and there have been many, many studies looking at the possible health benefits of resveratrol. But it turns out that you can get the same cardiovascular benefits of red wine from dinking moderate amounts of any form of alcohol. While some early studies found wine to be healthier than other alcohol, more recent studies have concluded that such observed differences were due to the fact that wine drinkers tend to have healthier lifestyles than other drinkers. For more info, see An Updated Twist on the French Paradox in our article Health Benefits of Red Wine and Alcohol. But is resveratrol itself still beneficial to your health? The short answer: probably not. Let’s take a closer look at resveratrol itself. Resveratrol is an antioxidant that’s found in the skin of red grapes. It’s a naturally occurring compound that’s also found in other plants like peanuts, chocolate, berries with red or purple skin and Japanese knotweed. See high resveratrol foods below for more info. Resveratrol is produced by certain plants primarily as a defense mechanism when they are attacked by fungi, bacteria or other pathogens. It may also be produced when they are injured or otherwise stressed. So the same species of plant may have different levels of resveratrol, depending on the climate and conditions where it’s growing. Resveratrol is found in grape skins, so red wines have much more of it than white wines. That’s because during the wine making process the skins are removed from white wine much sooner than from red wines. But not all red wine grapes have the same amount of resveratrol. They produce resveratrol to help fight off a grape disease mold and fungus, so you’ll find more resveratrol in grapes that are grown in cooler, damp regions where the fungi are more common. So which wine is best? That’s hard to say because the same variety of wine grown in different regions or different years will have different levels of resveratrol, depending on that year’s weather, climate, micro-climate, and the harvest date. If the wine grapes were attacked by mold of fungus, they’ll have more resveratrol. Cornell University researcher Leroy Creasy looked at 100 wines from around the world and he found the highest amounts of resveratrol in Pinot Noir from cool damp regions like New York or Oregon’s Willamette Valley. He found that wines from warm, dry regions like California typically have the least resveratrol. For example, he found that New York Cabernet and Merlot had higher concentrations than the Cabernet and Merlot from California. As a rule of thumb, any grape grown in cool, damp conditions is likely to have more resveratrol than grapes grown in warm, arid climates. Wine and grape juice are indeed the best source of resveratrol — except of course for resveratrol supplements. But what other foods besides wine have resveratrol? Surprisingly, it turns out that the next best resveratrol source is… chocolate! Reporting in the Journal of Agricultural and Food Chemistry, researchers in Hershey, Pennsylvania (of course!) found that on a per serving basis, products with cocoa had more resveratrol than any food except wine and grape juice. The more cocoa, the more resveratrol. So that means that cocoa powder and dark chocolate have more than milk chocolate or chocolate syrup. Peanuts are another good source. Blackberries, blueberries, cranberries, mulberries and raspberries also contain resveratrol. But as with wine grapes, the amount of resveratrol in these berries varies depending on climate, weather, and date of harvest. 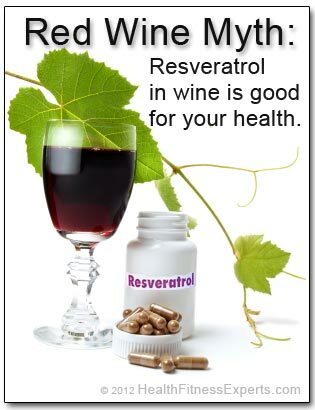 There is a lot of good news regarding the potential health benefits of resveratrol. Unfortunately, very few studies have been done on humans. But let’s take a quick look at some of the findings of the animal studies. Resveratrol has been found to extend the life of yeast, worms, fruit flies, and fish. More recent studies have looked at the health effects of resveratrol on mice. For example, Harvard researchers fed high doses of resveratrol to middle-aged mice on an unhealthy high-calorie, high-fat diet. Such a diet would normally have shortened the lives of the mice, but researchers found the mice given resveratrol had longer lifespans, more similar to mice on a healthy diet. Many studies have shown that a calorie restricted diet can prolong the lives of rats and mice. A study published in 2008 in the Public Library of Science One showed that resveratrol has the same effects. Researchers fed middle-aged mice a normal diet plus relatively low doses of resveratrol and compared them to mice on a calorie restricted diet. The resveratrol mice showed the same positive health changes as the calorie-restricted mice, leading them to believe that resveratrol had the same anti-aging, life-prolonging benefits. Resveratrol has been found to prevent various intestinal, esophageal, and breast cancer in mice and rats. However, this success applied only to cancer that was created intentionally with chemical carcinogens. Unfortunately, animals that had naturally occurring forms of cancer were not helped by resveratrol. Test tube laboratory test have shown that resveratrol is effective at preventing the growth of various human forms of cancer such as cervical, ovarian, breast, prostrate, pancreatic, stomach, colon, thyroid and skin cancers. But unfortunately it’s unlikely that oral doses of resveratrol would have any effect on these cancers the human body. Much more research is needed to establish any real cancer benefit. Degenerative neurological disorders such as Parkinson’s, Alzheimer’s, and dementia are not fully understood. But researchers believe that a major contributor to such diseases is the formation of plaque in the brain. Several studies have shown that resveratrol prevents the buildup of plaque in the brains of animals, and thereby provides protection to slow the onset and progression of such diseases. For example, in 2009, Cornell University researchers reported that laboratory mice fed resveratrol showed 48% – 90% lower plaque formation in the various parts of their brains. That’s very promising news. While various studies provide some potentially good news supporting the health benefits of resveratrol, these results cannot be readily applied to humans. It’s important to note that almost all the studies have been done only on animals and that the researchers typically used ridiculously high doses of resveratrol that you could never get from drinking wine. Depending on the study, you’d need to drink between 50 and 200 glasses of wine to get the same relative amount of resveratrol used by researchers. And of course, while some of these positive effects were indeed seen in mice and rats, there is no proof that humans will get the same benefits. Recent studies looking specifically at resveratrol in wine have cast even more doubt on its benefits. In June of 2012, another group of Dutch researchers at Erasmus University Medical Center published a study that looked at patients with high blood pressure. They gave them supplements that contained the same amount of resveratrol found in 3 glasses of wine. Disappointingly, the researchers found no change in the test subject’s blood pressure. So it seems that the resveratrol found in wine is not responsible for any cardiovascular benefits. To make matters worse, resveratrol is sensitive to both oxygen and light. Since it’s typical to let red wine “breath” for a while before you drink it, much of the resveratrol in the wine will likely break down before you get a chance to drink it. And even worse, resveratrol in wine is not absorbed very well by the digestive system. So you may be getting even less resveratrol than you think. Is there any good news? Yes! Wine does actually have many health benefits. But most of them come from the alcohol, not the resveratrol. So not only are there many reasons to drink wine, but you can actually get the same benefits from drinking any form of alcohol. Find out more by reading our article about the health benefits of wine and alcohol. If you can’t get enough resveratrol from wine or other food sources, should you try resveratrol supplements to boost your health? Many companies are now producing such supplements. They typically extract the resveratrol from the Japanese knotweed plant rather than grape skins. Recently there have been some resveratrol supplement studies conducted on humans and these have shown some benefits. For example, a small Dutch study published in 2011 showed that 150 mg per day of the resveratrol supplement resVida® helped increase metabolic rates in obese men. So without getting off the couch or changing their eating habits, they had some of the same health benefits they would have seen if they had exercised more and eaten less — including a lower their risk of getting type 2 diabetes. That sounds good. But unfortunately that study looked at only 11 obese men for a period of 30 days. Much more research is needed on humans to establish the long term health benefits — and possible health risks or adverse side effects — of resveratrol in humans. You might look at all the positive results reported in the studies on mice and rats and think that supplements might still be worthwhile. But the resveratrol dosages given to the mice were incredibly high. For example, looking at the Harvard study that appeared to counteract the negative effects of a high-fat, high-calorie diet, you would need to take over 1,500 mg of resveratrol supplements to match the relative amount given to the mice. Supplement brands like resVida, TruNature, Douglas Labs, Bricker Labs, and GNC sell resveratrol supplements in doses from 30 mg to 250 mg per pill. So you’d be taking from 6 to 50 pills per day. That would be prohibitively expensive — and possibly very dangerous to your health. What does all this mean? It means that more research is needed to see if large doses of resveratrol have any health benefits, health risks, or side effects in humans. Since there is no meaningful research, you should not waste your money or risk your health taking resveratrol supplements. And what about wine and other natural sources? The amount of resveratrol you get from natural food sources is unlikely to have a meaningful impact on your health. But you’ll get plenty of other health benefits from drinking red wine and eating dark chocolate in moderation. And red and purple skinned berries are also very healthy for you. So go for it! But you shouldn’t alter your eating or drinking habits just to boost your resveratrol. Do you have any thoughts on the health benefits of resveratrol? Let us know by leaving a comment form below. Attiki, Greece: International Institute of Anticancer Research. Cytokine Research Laboratory. Department of Bioimmunotherapy. The University of Texas, Houston, TX, USA. Department of Psychiatry and Behavioral Sciences. Duke University Medical Center. Durham, NC. San Francisco, CA: Public Library of Science. LifeGen Technologies, LLC. Madison, WI, USA. Basingstoke, England: Nature Publishing Group. Department of Pathology. Paul F. Glenn Laboratories for the Biological Mechanisms of Aging. Harvard Medical School. Boston, MA, USA. New York: Nature Publishing Group. Department of Internal Medicine. Division of Pharmacology. Vascular and Metabolic Diseases, Erasmus University Medical Center. Rotterdam, The Netherlands. Web. 29.20 (5 Feb 1998). Ithaca, NY, USA: Cornell University. Bethesda, MD, USA: American Society of Clinical Nutrition. Pennington Biomedical Research Center. Baton Rouge, LA, USA. The Hershey Center for Health and Nutrition. Hershey, Pennsylvania. Klatsky A L, et al. New York: CBS Broadcasting, Inc.
American Journal of Enology and Viticulture. Davis, CA, USA: American Society for Enology and Viticulture. Journal of the Chemical Society of Japan. Cambridge, MA, USA. : Cell Press. Top Institute Food and Nutrition. Wageningen, The Netherlands.